You create recommendations by creating ContentRecommendation objects through the ContentRecommendation.Builder() class. In addition to the attributes in this class, you can also include Amazon-specific extras to better integrate with Amazon Fire TV. Amazon's recommendations use the standard Android ContentRecommendation.Builder API. For full details, see the Android documentation on Recommending TV Content and the ContentRecommendation.Builder class. In addition what's included in the Android documentation, you can expand the recommendations functionality in your notification objects with Amazon-specific extras. These extras help integrate the recommendations into Amazon Fire TV in deeper ways. Before diving into code examples, let's look at a sample recommendation card. The numbers show several attributes set through the Android API and one attribute set through an Amazon extra. Sets an abbreviated name for your app, which is used in the launch menu. This is set by one of the Amazon extra fields: com.amazon.extra.DISPLAY_NAME", "displayName". For example, if your app has a long name, such as "World Premier Association Videos for Fire TV," this long title will be truncated in the launch menu. Instead of accepting the default truncation, you can specify the shortened name for your app through the Amazon extras (in this case, the DISPLAY_NAME). The following screenshot shows how the AOL On app customized the text in the launch menu using Amazon extra fields. Note: Before creating recommendations, you must add the Application Recommendation Support Library for TV to the dependencies block of your app's build.gradle file. .setContentImage(myBitmap) // From API 23 this method also accepts Icon as argument. .setMaturityRating(mMaturityRating) // This method won't have any influence on ratings on Fire TV. Use the com.amazon.extra.MATURITY_RATING setting instead. //Specifies how recommendations from one app is ordered. //Assign a Live Content to this recommendation. The Amazon extras are added to the notification object. The values passed to the methods and extras (such as mText or mContext are assumed to be set elsewhere in the code. (For the sake of space, this part of the code isn't shown.) More information for using the Android recommendations API and Amazon extras are provided in the following sections. Follow these guidelines when using the ContentRecommendation.Builder from the Android API. 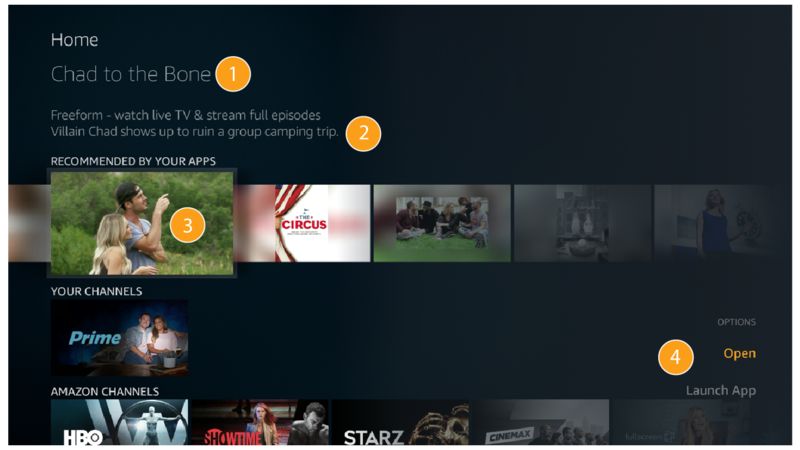 These guidelines will help your recommendations align with the look and feel of Amazon Fire TV. Note: Because the descriptions of these standard Android API methods are from the Android documentation, they're set off in quotes to distinguish them from any additional notes we have added. setTitle(java.lang.String) "Sets the content title for the recommendation." The length limit is 125 characters. Additional text is truncated. setText(java.lang.String) "Sets the description text for the recommendation." setContentImage(Bitmap image) "Sets the recommendation image." Recommendations without images either won't be displayed or will receive a default placeholder instead. Images with an aspect ratio other than 16:9 will be letterboxed. (Letterboxing means black bars will appear along the sides or top to compensate for the empty space.) Images larger than the specified dimensions will be scaled down to fit the space, preserving the 16:9 aspect ratio. setGenres(String genres) "Sets the content genres for the recommendation. These genres may be used for content ranking. Genres are open ended String tags. Some examples: 'comedy', 'action', 'dance', 'electronica', 'racing', etc." Use the standard Android genres. setContentTypes(String types) "Sets the content types associated with the content recommendation. The first tag entry will be considered the primary type for the content and will be used for ranking purposes. Other secondary type tags may be provided, if applicable, and may be used for filtering purposes." Only standard Android content recommendation categories are allowed. setProgress(int max, int progress) "Sets the progress information for the content pointed to by the recommendation." The progress amount for the content must be in the range (0 - max). The unit is seconds. Note: Setting a background image using setBackgroundImageUri() is not supported. The following table lists extras that you can add to your notification objects. Note: "Used" (the column on the far right) indicates whether Amazon Fire TV currently makes use of this data in the Fire TV recommendations display on the home screen. Even if an extra isn't used now, it may be used in the future with upcoming Fire TV releases. com.amazon.extra.MATURITY_RATING String Displays the rating below the title. The rating is also used by the Parental Control settings on Amazon Fire TV to determine if content playback needs to be behind a PIN. Any recommendation without this extra or without a value for setMaturityRating() will be treated as Mature content and may require a PIN subject to the Parental Control settings on the device. com.amazon.extra.ACTION_OPTION ArrayList<int> Determines the context menu options displayed for each recommendation. Two context menu actions are supported, but only the first action is configurable. 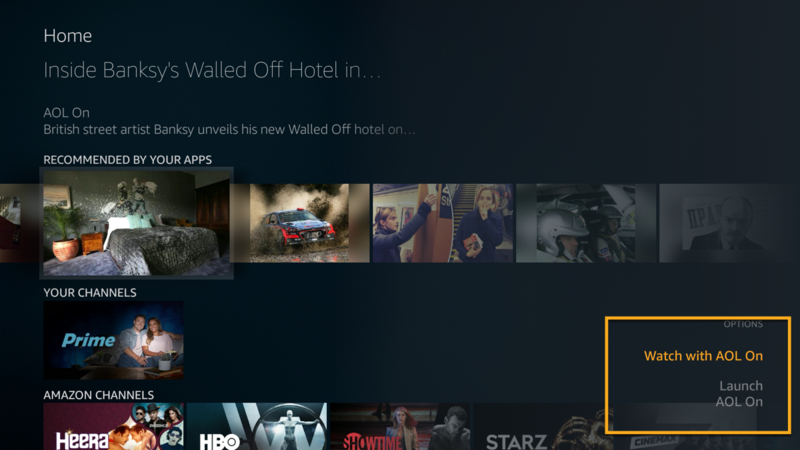 When users click a recommendation tile or its first context menu option, Amazon Fire TV uses the corresponding content intent data passed with recommendation to launch the app. Note: If your app is providing an action array list, the com.amazon.extra.DISPLAY_NAME (mentioned above) is required. If no value is provided, the default action will be Open and below that, Launch <App Name>. com.amazon.extra.CONTENT_CAPTION_AVAILABILITY int Caption availability of content. To send recommendations when the device boots up, your app must have the RECEIVE_BOOT_COMPLETED permission. This permission lets your app receive and handle the broadcast that tells the app your device was booted. The initial launch point for supporting recommendations is to create a subclass of BroadcastReceiver. In the manifest, register the receiver as handling the ACTION_BOOT_COMPLETED intent. When the system first boots up, all applications that are interested will get an initial 'ping' to generate their recommendations. For more details, see this How to Start an Application at Device Bootup in Android tutorial on Stacktips.com. As a best practice, delete recommendations after users watch the recommended content. You can call cancel() for a specific notification ID to delete the recommendation.